Use with any other skin care product! Layer under vitamin C+ Firming serum for the ultimate in antioxidant protection. 18 powerful antioxidants, more than any other skin serum, defend your skin against the root cause of almost every skin care problem: FREE RADICALS. Acne, premature aging, hyperpigmentation, surface dryness, loss of firmness, redness and irritation are only a few skin problems with free radicals as their root cause. Free radicals come from all parts of your life: exercise, sunlight, smoke, air pollution, ozone in airplane cabins, even poorly formulated skin care and sunscreen products. These highly unstable molecules attack healthy cells and tissues triggering inflammation and the start of the premature aging cascade. Young cells are programmed to make antioxidant enzymes that naturally keep free radicals under control. As we age and are exposed to free radicals over time, our cells begin to lose the battle against free radicals. This is what molecular biologists refer to as “oxidative stress”. In other words, there are more free radicals than your cells can control. By the age of 30, every cell in your body is thought to be in a state of oxidative stress. CSRx Antioxidant Defense Complex is formulated to control EVERY form of free radical that contributes to oxidative stress and harms your skin. This complex is powered by 18 high potency antioxidants that allow you to control and eliminate free radicals threatening the health of your skin. 6 Superfruits – Acai Berry Extract, Gogi Fruit Extract, and Noni Fruit Extract, Mangosteen, Pomegranate and Coffee Berry – rank among the most powerful in the natural antioxidant grading system. White Tea Extract and Green Tea Extract neutralize free radicals from smog, tobacco smoke and other forms of air pollution for fresh, hydrated, comfortable skin – no matter how bad the air gets. Additionally, Green Tea Extract protects against UVB-induced photo-aging and wrinkle formation. Astaxanthin. The most potent antioxidant carotenoid found to date. An orange pigment from micro algae, it is 1000 times stronger than vitamin E, protects from inflammation, surface dryness, DNA damage by UV radiation and ozone, and interrupts the aging process aggravated by sugar, browned food and alcohol. Ergothioneine. A superior antioxidant to CoQ10 and Idebenone, this unique amino acid found in mushrooms is the key energizing antioxidant for your cells. Protects from ozone in smog and plane cabins, brightens your skin and interrupts the aging process aggravated by sugar, browned food and alcohol. Garden Sprout extract supports your skin’s natural detoxifying enzymes – enhancing cellular resistance to and the elimination of environment toxins. Pear, Hibiscus and Assafoetida protect from sunlight-derived free radicals that damage DNA and are at the root of wrinkle formation, inflammation and skin sensitivity. Omega-rich Sunflower and Safflower oils keep your skin soft, hydrated and calm by fighting off free radicals that destroy your skin’s natural moisture barrier. Thermus Ferment Extract repairs and protects against heat-activated free radicals that destroy DNA, cell membranes and skin-protecting lipids. Lipochroman-6 – a vitamin E-like molecule – targets nitrogen free radicals known to damage DNA, falter youthening proteins, increase inflammation and trigger cell death. Can be used before any other skin care products. One pump in the morning and one pump at night after cleansing and exfoliating. Results observed after seven days of use. Always use an effective daily sunscreen with any skincare product. Hybrid Sunflower Oil, Safflower Oil, Ergothioneine, Acai Berry Extract, Gogi Fruit Extract, Noni Fruit Extract, Mangosteen Extract, Pomegranate Extract, Coffee Berry Extract, White Tea Extract, Green Tea Extract, Astaxanthin, Lepidum Sativum Sprout Extract, Pear Fruit Extract, Hibiscus Flower Extract, Assa Fotetida Root Extract, Thermus Ferment Extract, Lipochroman-6. Follow with C+ Firming serum to stimulate collagen synthesis and reduce hyperpigmentation. If under continuous stress, follow both CSRx Antioxidant Defense Complex and C+ Firming serum with Stress Recovery Complex. Bring with you to use with or after LED, IPL, skin needling, microdermabrasion, and laser treatments. What Active Ingredients make CSRx Antioxidant Defense Complex so effective? Six Super Fruits – Acai Berry, Gogi and Noni Fruits, Mangosteen, Pomegranate and Coffee Berry – rank among the most powerful in the natural antioxidant grading system. White and Green Teas neutralize free radicals from smog, tobacco smoke and other forms of air pollution. Skin remains hydrated and comfortable regardless of air quality. Astaxanthin is the most potent antioxidant in the carotenoid family. This ingredient gives the formula its orange color. It is 1000 times stronger than vitamin E, reduces inflammation, protects skin cells from DNA damage caused by UV radiation and ozone, and interrupts the aging process caused by sugar, browned foods, and alcohol. Ergothioneine is a superior antioxidant to CoQ10 and Idebenone. It is a unique amino acid found in mushrooms. It is the key energizing antioxidant present in skin cells. As with Astaxanthin, it protects skin from pollution, sugar, browned foods and alcohol. It also brightens the skin – a nice benefit. Lepidum Sprout Extract supports your skin’s natural detoxifying enzymes – enhancing cellular resistance to and the elimination of environment toxins. It’s the natural “cleanse” for your skin cells. Pear, Hibiscus, and Assa Foetida Extract protect from UV radiation-derived free radicals that damage DNA and are at the root of wrinkle formation, the inflammation cascade that starts premature aging, and skin sensitivity/redness. Combined with C+ Firming serum, these extracts “soak” up UV derived free radicals before they can ruin your collagen layer leaving it thin, brittle, and skin discolored. Sunflower and Safflower Oils rich in omega vitamins keep skin soft and hydrated and calm while resisting free radical assaults that destroy your skin’s natural moisture barrier. Thermus Ferment Extract protects and repairs skin exposed to heat-activated free radicals that deform DNA, cell membranes, and damage your skin’s natural lipid barrier. Lipochroman-6 is a molecule that targets nitrogen free radicals (as opposed to oxygen free radicals). These nitrogen free radicals damage DNA, promote premature aging, initiate the inflammation cascade that leads to early cell apoptosis (cell death). Skin looks worn and dull before its time. Are EIGHTEEN antoxidants really necessary? Yes. There are over 12 types of free radicals that regularly attack your skin. Molecular biologists have recently identified these free radicals and have determined that multiple antioxidants are needed to protect skin completely. CSRx Antioxidant Defense Complex protects your skin from ALL forms of free radicals identified while it allows your skin to repair itself. Do I still need to use my C+ Firming serum? Yes. L-ascorbic acid (Vitamin C) is not made by human beings. We are the only mammals that do not make our own Vitamin C. Since it is required for collagen synthesis, it is optimal to get the plasma levels of Vitamin C as high as possible in the skin so that new collagen can be formed. Additionally, Vitamin C limits melanin production. This helps to control hyperpigmentation and fade away brown age spots to keep your overall complexion even-toned. Ergotheneine also helps to brighten the complexion but does not limit melanin production specifically. CSRx Antioxidant Defense Complex can be used under your C+ Firming serum to give you the ultimate in protection, prevention, and skin repair. Free radicals are unstable oxygen and nitrogen molecules formed when we exercise, eat certain foods, drink alcohol and/or are under stress. Because they are unstable, they like to find other larger molecules, for example, the collagen molecule, to attach to – this stabilizes the free radical molecule but damages the targeted cell. Thus, a high sugar diet, drinking heavily and being under stress can result in skin that looks and acts in an unhealthy manner. Free radicals are also formed in your cells after exposure to sunlight, cigarette smoke, air pollution and even nitrogen evaporating from soil. Even poorly formulated skin care products and sunscreens can deposit free radicals on your skin. Plus, we live in an oxygen-rich atmosphere: oxidative stress is THE biggest source of free radicals. That’s right – the air that we breathe causes the formation of these damaging molecules. Young cells are programmed to form enzymes that protect cells from free radicals. But as we age and are exposed to more and more free radicals, our natural antioxidants start to lose the “war” on free radicals. Molecular biologists call this “oxidative stress” and by the time you are 30, EVERY CELL IN YOUR BODY IS GENERALLY IN SOME STATE OF OXIDATIVE STRESS. What can you do? 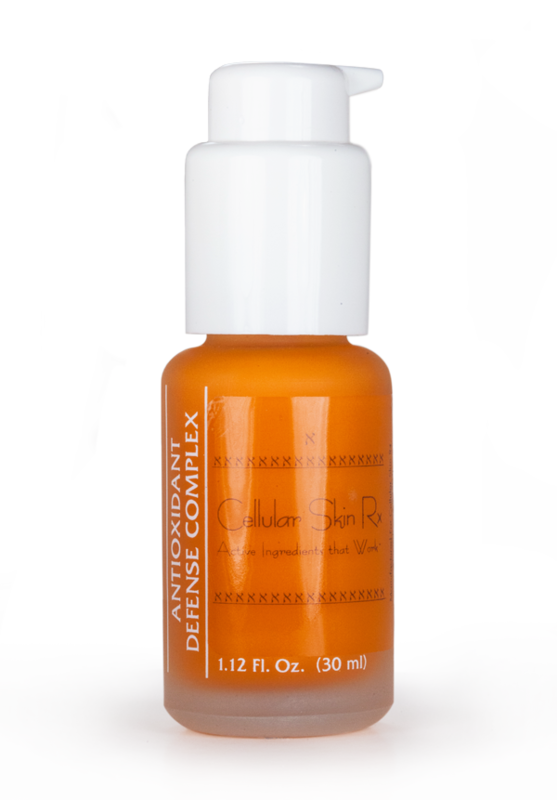 Protect, prevent, and repair with a high potency antioxidant formula: CSRx Antioxidant Defense Complex. This complex will control every type of free radical that contributes to oxidative stress and thus, damages your skin. How do Free Radicals damage my skin? No one has perfect skin. All of us will need some sort of specialized treatment for a skin care problem at some time in our lives. Although different sources cause skin care problems (damage from sunlight, bacteria on the skin, poor diet, exposure to chemicals), the root cause that all skin care problems have in common: Free Radicals. These unstable molecules attack healthy tissue and cells, trigger inflammation and premature cell death. What do you see in the mirror when these processes are occurring or have occurred? Dehydration, crepiness, redness, acne flare-ups, skin sensitivity and irritation, inflammation, lack of firmness, wrinkling, age spots, dryness and tanning. Thankfully, you can control and eliminate these free radicals threatening to damage your skin by using CSRx Antioxidant Defense Complex twice each day. What results can I expect to see after using CSRx Antioxidant Defense Complex? In just seven days, most can expect to see a remarkable change in their skin. Results include softer, smoother, firmer, more radiant, clearer, brighter, more supple skin. Redness is diminished. And remember, you can add the complex to ANY skin care routine and it can be used under ANY skin care product (including retinoids). It works regardless of age, present skin condition, or ethnicity. We call it the “radical treatment for the life of your skin.” Twice each day use is preferred though once each day will also yield results. I’ve used and loved many Cellular Skin Rx products but my hands-down favorite is the Antioxidant Defense Complex. The texture and vivid color of the product make it a pleasure to apply …. and if there is one CSRx product with immediate results, this is the one. Within a few days, your skin feels smoother, is more even-toned and — i’m not exaggerating — actually glows! There are no miracles in skin care, but this comes very close! Hi,my favorite product is the CSRx Antioxidant Defense Complex because it smooths my skin and after 2 weeks of use, I see a real difference: it has a real firming effect and it brightens my skin. I think this is the most remarkable antioxidant product I have ever used.